I’m making it a goal this week to start going to bed earlier and wake up earlier a little at a time. My goal is to be up and walking or jogging with the dogs well before work in a few weeks. But this is the kind of thing I have to break myself in gently for so this morning I was up making a tasty iced coffee, writing out my to-do list for the day, then typing up this blog post (which is still a big change from my usual fast-fast-fast last minute morning routine). 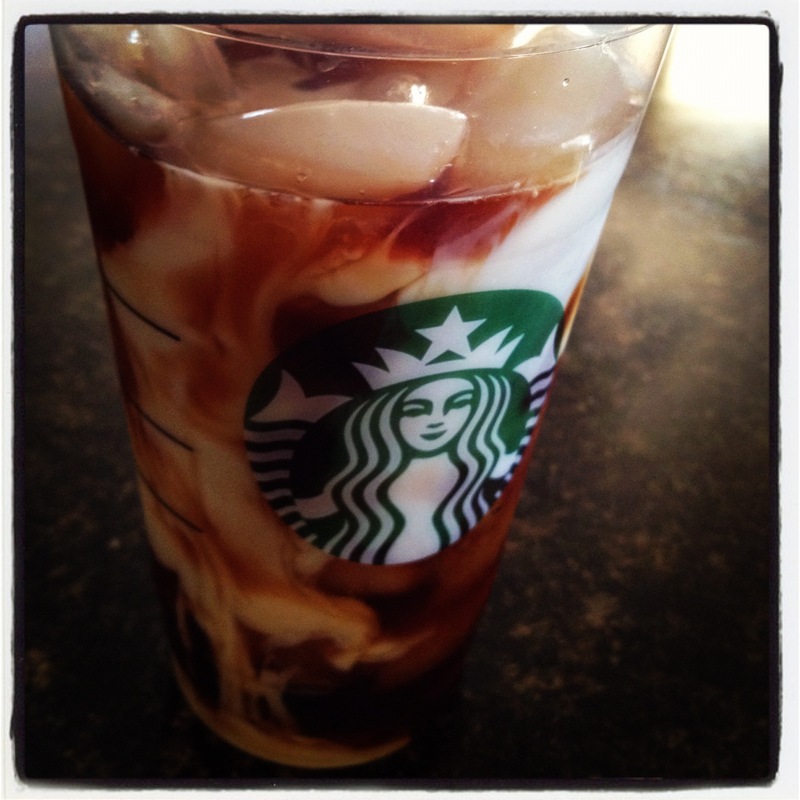 This iced coffee’s gonna change my life. I got the idea from Pioneer Woman but skipped the half&half and sugar, so mine’s only 20 calories (making it healthier than my DIY frappuchino, which, while tasty, is not an every day beverage. THIS is the kind of thing to get your Monday’s going). Strong brewed iced coffee. I made mine with Starbucks Breakfast Blend grounds. I put about 1/2 a pound of grounds in a pitcher and added about 5 cups of water. I let is cold brew in the fridge for about 12 hours then strained the grounds out with a mesh strainer lined with paper towels. I decanted the brewed coffee into a couple of jars for the fridge and it should last me all week. Net week I may add a few tbs of Espresso grounds for a kick. 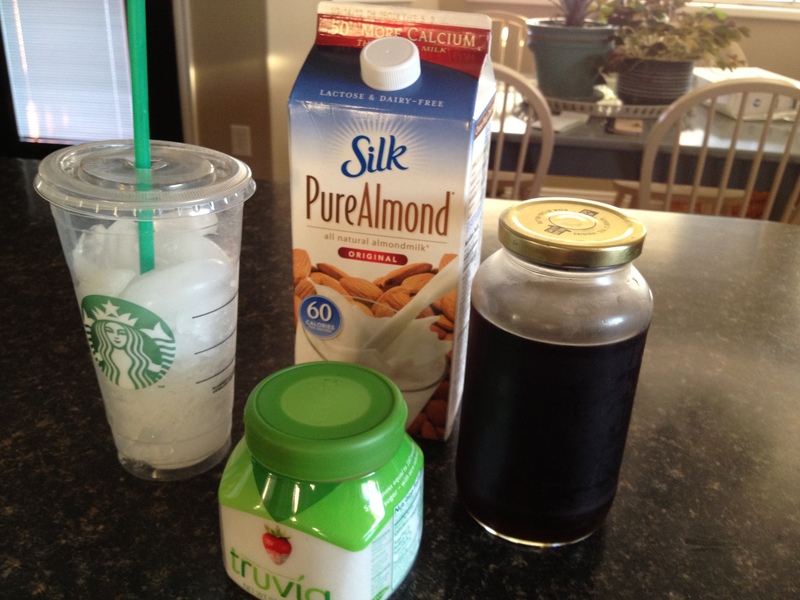 Almond milk (or soy milk, or regular milk. I just prefer almond). I used 1/3 cup for 20 cal. Truvia or another natural sweetener. I used a tsp for 0 cal. Mix them all together. I used a cup from yesterday’s $3.19 iced coffee. My batch will make a week’s work of coffee for about $3. Yippee! I love how milk looks poured into strong, dark coffee. So pretty. I hope everyone’s week starts out fabulously!